Extending the capabilities of its widely-used IP Management Platform (IPMS), D&R today announced a new advanced version of its Software License Manager integrating Rule Assisted Decisions. This latest version significantly enhances support for administering and optimizing Software License Management through the use of configurable "Intelligent Advisers". The new Advisers are configurable by the platform administrator and use monitoring data results. The Advisers optimize remixing and renewing software licenses and those activities may become almost "automatic". With this new enhancement, IPMS™ provides an industry leading global integrated solution covering license administration, license remix/renew based on monitoring data analysis, finance and purchasing management. The result of all this is a Low Return on Investment for purchased software, which ultimately ends up impacting operations expenses in a negative manner. While corporations today can make significant investments in tools or platforms to monitor security (certainly an important focus nowadays), up until now, no integrated solution has been able to provide a global management platform that can efficiently manage software licenses and optimize the cost. What enterprises really need is a centralized location (portal) from which all license administration data and usage reports are available - a single location where all required administration activities, including license remix, renew, and purchase can be integrated and managed. This newest version of the D&R Software License Manager does exactly this with the assistance of flexible Advisers based on license usage report data. License monitoring is based on the usage of Flex Net License Monitor and usage result captures and parsed in real time. 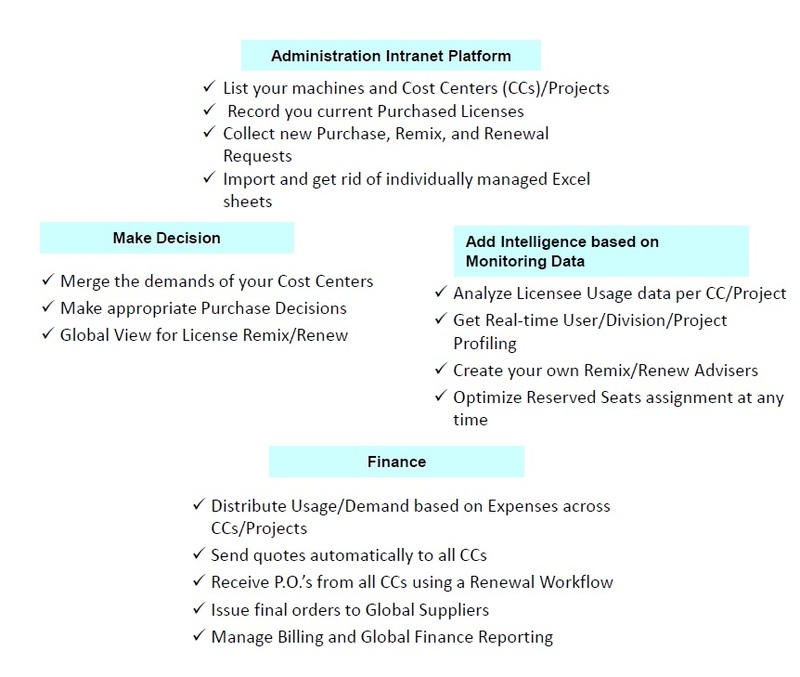 With these new Advisers, it is possible to renew or remix software licenses based on accurate usage report, to analyses users and groups behaviors, support a variety of cost sharing scenarios, such as dividing up the cost of licenses among business units, or distributing cost across shared projects based on actual usage. You wish Face to face meeting? : Includes support for FlexNet monitor usage data.